Lately I've been searching the internet for some beautiful look-alike Marc Jacobs mouse flats. 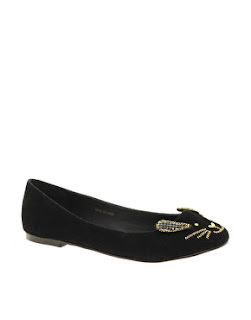 I just couldn't find a pair that I really liked until I discovered thes cute cats on asos :)! They weren't exactly what I was looking but maybe that's even better :). This way I'm not the girl with the fake mouse shoes. I picked the bronze ones and I absolutely love the color. Can't wait to wear them! These ballet flats are true to size (or maybe slightly on the bigger side but I sure wouldn't go down a size if I were you) and the quality is rather good for such a great price. The delivery was quick and correct as always with Asos :).